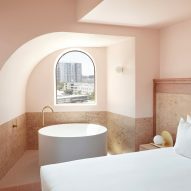 Sun-bleached pinks, sandy-beiges and gold decor details appear inside this hotel, which Richards and Spence has designed to reference to Brisbane's balmy climate. 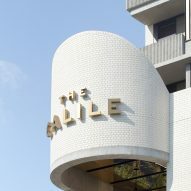 Decked out in warm hues, The Calile Hotel in Brisbane, Australia, has been designed by locally based architecture studio Richards and Spence to "deliver a resort experience in an urban setting". 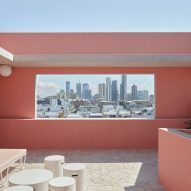 "In our opinion there is no other city-based Australian hotel conceived as a resort," explained the studio. 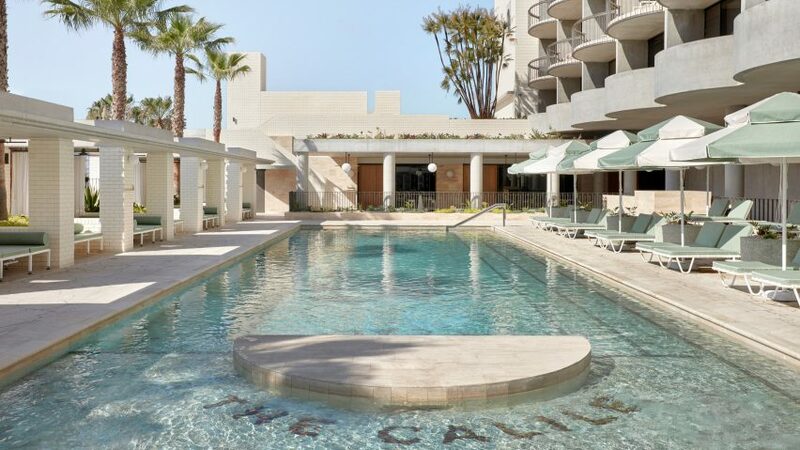 "City-based hotels in our country are pitched to a corporate market [which are] focussed on conferences, rather than on the pool and the hotel's surrounds – The Calile will change that." The white-brick hotel is located at the centre of Bribane's buzzing James Street precinct, surrounded by independent fashion boutiques, eateries, design showrooms and galleries. 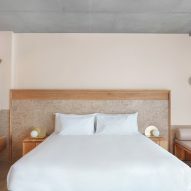 Eager to avoid the dour selection of colours and materials often used within urban hotels, the studio instead tried to develop a "tropical vernacular" throughout The Calile Hotel's interiors. Throughout the hotel's 175 rooms – nine of which are suites – surfaces have been painted pale pink. The lower half of walls have been panelled with cork, which extends onto the floor. Blush-coloured or sky-blue tiles clad the bathrooms, complemented by brass faucets, mirrors, and towel railings. "We looked to other hot weather cities with a resort focus to inform our design – Miami, Palm Springs, Rio De Janeiro and Mexico City," said the studio. Arched doorways and windows have been incorporated throughout, echoing the shape of the scallop-edged balconies on the hotel's external facade. Some of the rooms also feature curved niches that accommodate freestanding bathtubs or grooved mini-bar counters. 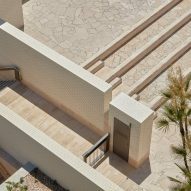 A warm palette is maintained in the hotel's communal areas, which are connected by a sequence of open-air walkways. "Our climate allows us to live outdoors most of the year. 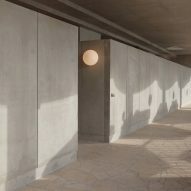 The naturally ventilated rooms allow guests to share our unique outdoor lifestyle, again reinforcing a sense of place that is uniquely Brisbane," added the studio. Rosy marble has been used to create the surface of tables in the restaurant, where there are also sand-coloured dining chairs. Striped, jade-green umbrellas provide shade to loungers by the pool, which features a semicircle sun deck at its centre. The hotel also includes a spa, poolside cafe serving Greek cuisine, and a 100-capacity amphitheatre that can be used for events. Similar to Richards and Spence, artist Camille Walala designed the Salt of Palmar hotel to complement the landscape of far-flung island Mauritius – it's interiors feature sea blues, sunny yellows and peachy oranges. Photography is by Sean Fennessy.